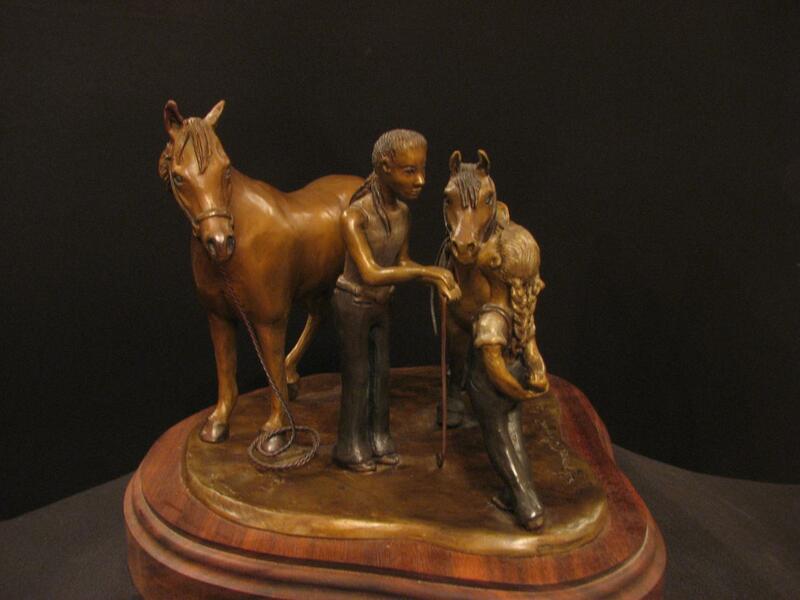 My father was my inspiration for this sculpture. He suggested "How about an antelope fawn and a wild horse colt playing with each other?" I loved the idea. This is for you, Dad. I imagine an inquisitive foal getting more than he bargained for when he pesters a precocious antelope baby. She's schooling him a little, but they're enjoying each other. This sculpture is about spring, youth, and meeting life's adventures with gusto. Limited edition of 10. Price of $3,100 includes wooden base. Shipping charges apply. Alatheia Riding Center, a therapeutic riding facility in Wenatchee, Washington, improves the lives of people with special needs through equine therapy. Founders Glenn and Nancy Grette's Fjord horse, Frid, and a very special little girl were the inspiration for this sculpture. Frid is known for "reading" a person's special needs and adapting her behavior for each rider. She is steady and unexcitable and can be recognized by her long braided forelock. This sculpture, commissioned by the Grette's, is entitled "My Wings" because therapy on a horse can do just that for a rider - make them feel like they're soaring. This piece honors the family and volunteers that provide these services to the Wenatchee Valley. And especially, it honors Frid. 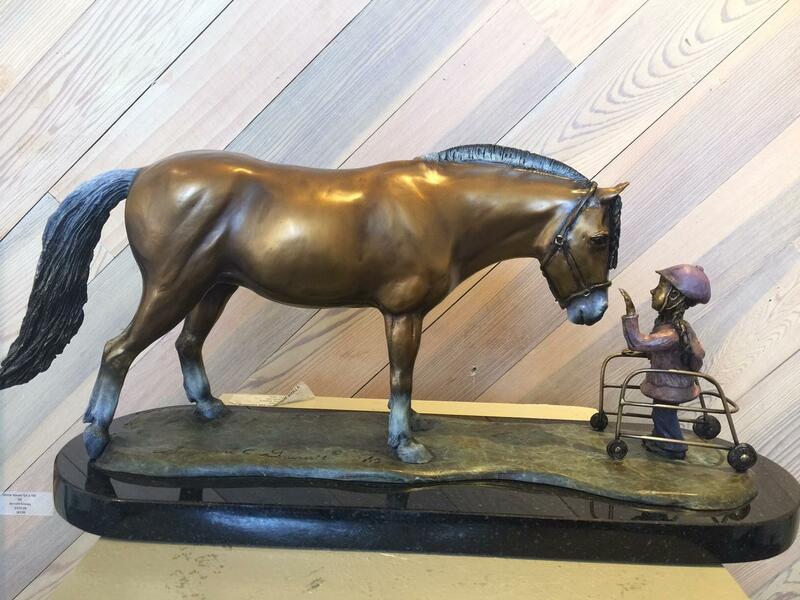 The piece is available in coordination with Alatheia Riding Center and the artist. My parents may wonder how they have raised such a horse crazy daughter, but I know my love of horses is at least partially inherited. Horses factored into my dad’s best “growing-up” stories, where he was a city boy who learned to ride the hard way at his cousin’s ranch in Montana. My mother also loves animals. She grew up on a Montana farm where her family raised wheat and cattle while she raised kittens and rode her black and white pony. Eventually, circumstances found both my parents at Montana State University in Bozeman. I’m sure my father discovered my mother’s love of animals. One of their first dates brought them to his cousin’s ranch for a “romantic” horseback ride. Dad checked out the prospective mounts – only two to choose from. He knew one of the horses was pretty high-strung. He didn’t know the other one, but it stood half-dozing in the sunlight. Mom got the dozer, until it bucked her off and they had to switch horses. Then, she got the fast one! This sculpture, entitled “Runaway Date” represents the drama that unfolded in the wake of this decision. On the way back, Mom’s horse grabbed the bit in its teeth and ran “hell bent for leather” all the way to the barn. Dad raced behind on his decidedly slower horse. When working on this sculpture, I tried to capture the determination he must have felt; to rescue her and NOT mess this up! On her face, I tried to show both fear and the resolution of a farm girl who would NOT fall off in front of her new boyfriend! Dad says he never caught her – that day, anyway. Mom made it back to the barn in one piece, and despite the harrowing experience, Dad still married his “Runaway Date” a few years later. Limited edition of 20. Price of $3,400 includes wooden base. Shipping charges apply. 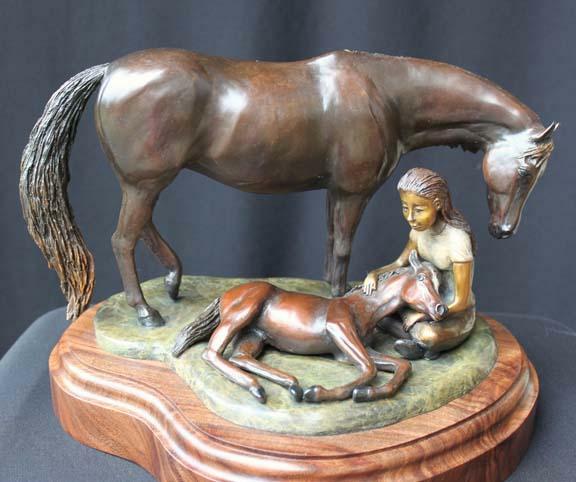 This sculpture represents two sisters who share a love of horses. The older girl is becoming an accomlpished young rider. Leading her horse after a workout, she is confident in her ability and pround of her new riding clothes. Lost in thought, she barely notices when her younger sister approaches nad takes the end of the lead rope. The little girl is half-awed and all escitement as she looks up at her older sister. her shoulders lifted bashfully, she tries to copy the horsemanship she's learned by watching. There's a world of difference between little girls at this age - one on the cusp of adolescent and new responisiblites; the other only able to dream and admire. when working on this sculpture, I wondered how many big sisters might look a it someday and appeciate their power of example. I also found myself hoping that the little sister wouldn't have to wait too long for her moment in the spotlight. 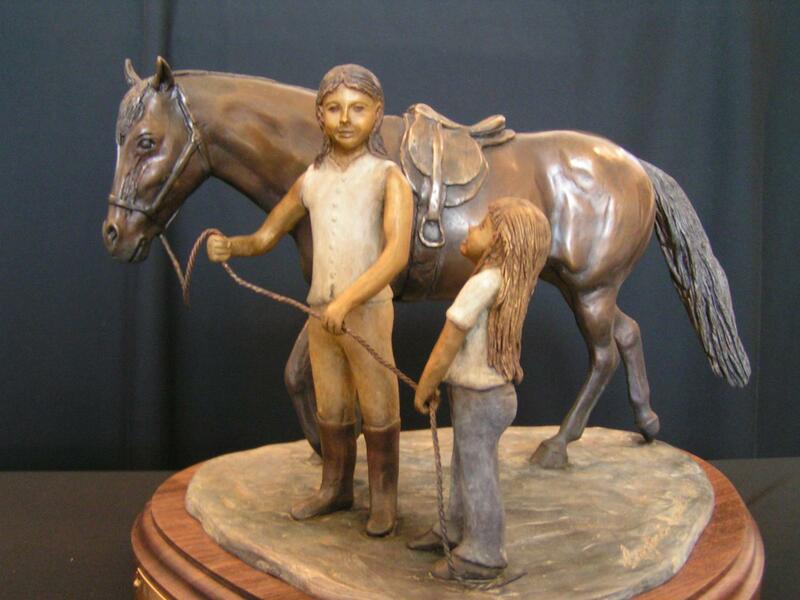 This sculpture captures the little girl's unspoken words to her sister - "I want to be Just Like You." Limited edition of 20. $2,200 price includes wooden base. Shipping charges apply. 8.5"h X 10"l X 8.5"
This sculpture is based on my own experience. When my Arabian mare gave birth to her first and only foal when I was 15 years old, I was thrilled. Even though she had every right to be protective of her colt, my mare let me share her new motherhood. I have a photo of me sitting on the ground in the shade cast by her body, right next to her little foal. One thing I always loved about that photo is how nurturing my mare looked; it almost felt like she was enveloping me in her mothering gaze along with her little one. In the years that followed, I would raise and train that colt myself, and he followed me to homes in three different cities. I still have both horses all these years later. They will always be special to me. I know I'm not the only woman out there who's been fortunate enough to have raised a foal from its mother's side. This sculpture is for all of us! Limited edition of 10. $2,200 price includes wooden base. Shipping charges apply. 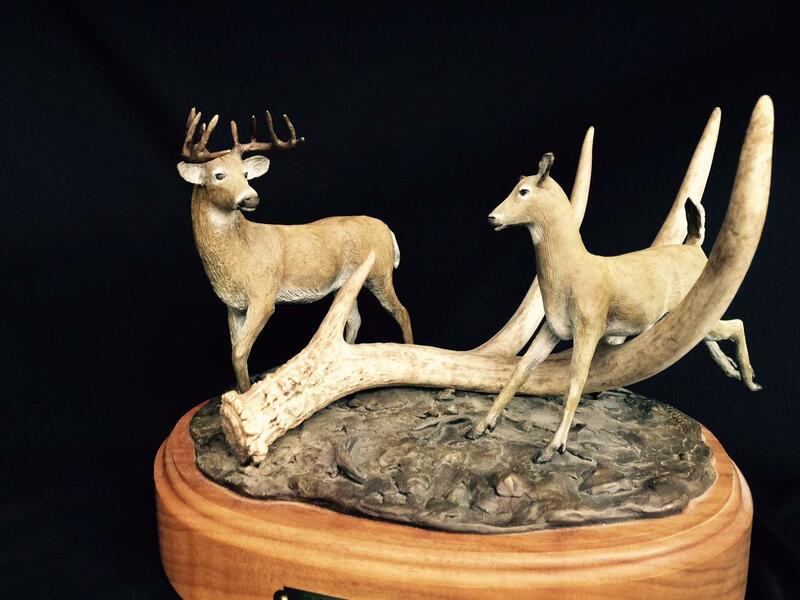 This sculpture incorporates a whitetail deer's antler into the setting of a wilderness romance. It's November and two whitetail deer, a buck and a doe, are drawn to each other by the season. In a bit of a role reversal, the buck is surprised when a young doe bursts upon the scene, gracefully leaping over a "branch" that's actually a tine of a real whitetail antler. This sculpture is destined to please wildlife lovers of every type, from those who appreciate the artistic animal form to hunters who understand the lure of November. Limited edition of 20. Please note that the antler in the sculputure is a real white tail antler. Therefore, some variation in the antler of each sculpture in the edition is to be expected, and contribues to the unique nature of each piece. $1,900 includes standard wooden base. Shipping charges apply. When my own mare foaled in 1990, I was surprised to see how proud she was of the barn’s new addition. Two days after giving birth in a box stall, she was released into the arena. Arching her neck and prancing, she galloped joyfully past the row of stalls where boarders kept their horses. The brand new colt raced at her side, tail waving jauntily in the air. My mare neighed at the top of her lungs, announcing her new status as a mom – and all the horses lined up to see and answer her call. Like curious neighbors they took note of my new colt – and I smiled as I watched him run, wondering what his life would be like. 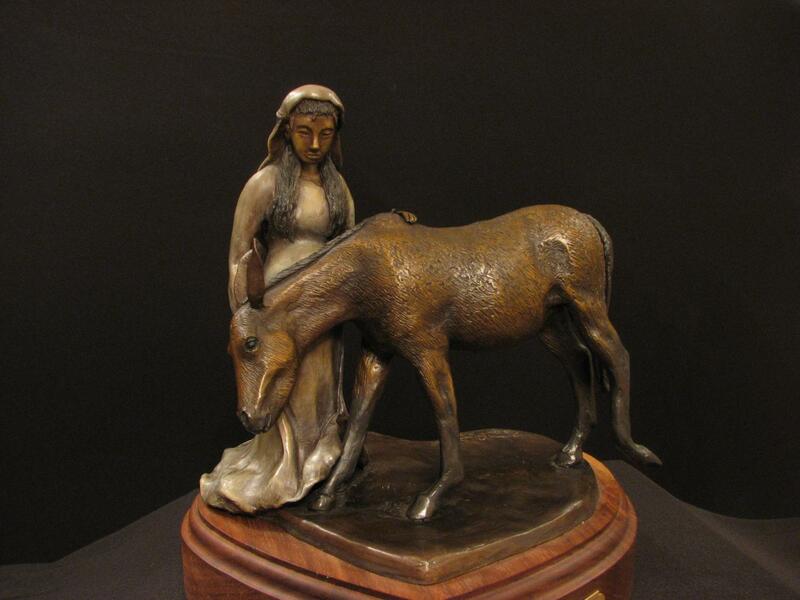 “Pride and “Possibility” captures the emotion of that day – a mare’s pride, and the wonder of a foal’s possibility. Limited edition of 20. $1,375 price includes wooden base. Shipping charges apply. Every woman who has graduated from a childhood pony to a brand new horse will recognize the bittersweet moment depicted in “The Hand-Me-Down.” A girl prepares to hand over the reins of a much-loved pony to her little sister. With flowing tail and braided mane, the pony’s appearance suggests it has been the recipient of doting girlish care. Alert and docile, its expression is a perfect invitation for a new riding partner – but also a testament to what the old one’s giving up. Yet the girl, almost a teenager, has obviously outgrown her pet. Behind her, a new horse stands forgotten as she offers the pony’s next pupil some sisterly advice. This lucky little girl, foot coyly twisted as she listens with barely concealed anticipation, can’t wait for her chance to ride. Limited edition of 20. $1,775 price includes wooden base. Shipping charges apply. Mary's ride to Bethlehem on a donkey is a powerful image in the nativity story. If you're like me, as a child you wondered how the tiny animal in biblical depictions managed to carry a very pregnant Mary such a long distance. Then as an adult, you are amazed at the endurance of the young mother. Religious art often shows Mary riding a donkey, being led by her gentle husband Joseph. Or, we see the beast standing humbly among other animals by the manger of the new-born Savior. In this sculpture, I wanted to capture that intimate moment between the Lord's mother and her sturdy servant, just prior to their arduous journey. Leaning raptly against Mary's abdomen, the donkey knows the child and gratefully prepares to carry "The Joyfully Borne Burden." Limited edition of 20. $1,300 price includes heart-shaped wooden base. Shipping charges apply. In this sculpture, Mary watches with gentle resignation as her son Jesus reaches out to touch a snow-white lamb. When working on this piece, I tried to capture Mary’s strength and vulnerability as she places her upturned hands in her lap. I think her gesture represents her complete surrender to God’s plan for her and for her child. Perhaps she already knows her son will someday embrace a sacrificial destiny. Limited edition of 20. 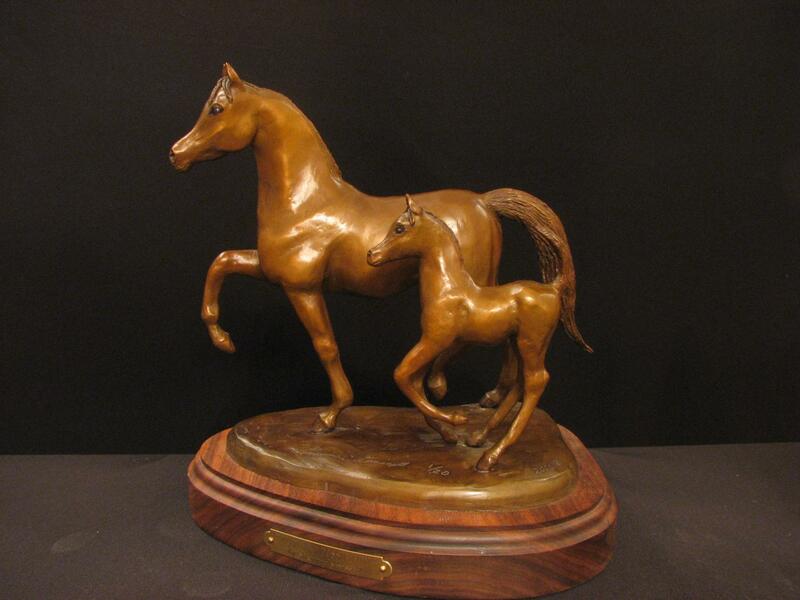 Precasting price of $1,300 iincludes wooden base. Shipping charges apply.